On September 3, I traveled to Los Angeles for the University of Minnesota Golden Gophers opening football game vs. the USC Trojans, which was played the following afternoon. My friend and I came out a day early to enjoy a little extra time in SoCal. After landing at LAX, our first stop was Manhattan Beach. While walking down the scenic Manhattan Beach Pier, we happened upon two very interesting sightings. The first unique visual involved watching a guy reel in a stingray straight from the Pacific Ocean. The second even cooler sight was that of US Soccer star Landon Donovan. 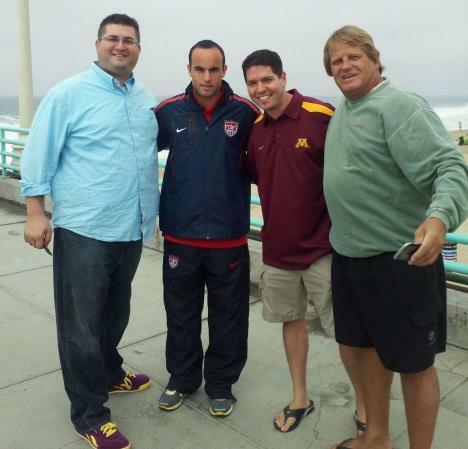 As a bonus, Donovan was wearing a US Soccer warm up suit when we bumped into him. Ironically, the national team had a game vs. Costa Rica that very night at the Home Depot Center in nearby Carson. I was hoping to spot a famous athlete in Manhattan Beach after reading about how someone saw Maria Sharapova in the very same area a few weeks prior. Turned out that Donovan is also a resident of the high end beach city. Donovan stopped to say hello and take some photos with people who had taken notice of him. We actually had a stranger join us in the photo because Donovan said he was running out of time, so the guy on the right jumped in and took part in our picture. Kind of weird, but I guess it added to the story. US Soccer lost to Costa Rica 1-0 that night and the Gophers nearly pulled off a massive upset of USC the next day at the LA Coliseum. At least one of the team’s could claim a moral victory. Unfortunately for probably the most famous American male soccer player of all-time, it wasn’t his squad.